Ground stations located on the map of Iran , I assume that some of them are stationary and some of them are mobile . Again, very interesting. Certainly subject for further research. I'm interested in the sites near Tabriz and Meshad because there's been a lot going on around Tabriz and I keep wondering if Iran has repurposed the Shah-era CIA TACKSMAN 2 site (37.2957 N , 58.9152 E) outside of Meshad. I have finally got around to running the orbital data from Space-Track through my own software and come up with the following data. Using both objects A and B, catalogue numbers 38075 and 38076 respectively, the estimated launch time comes out as being 00:02 UT on February 3rd. From the reported launch time of 05:34 local time and allowing for the difference in time zones I think that this will correspond to an actual launch time of 00:04 UT, especially since the only orbital data are for more than 19 hours after the launch (these are element sets 5, so will Space-Track please issue sets 1-4?). The later after launch the TLEs are the more inaccurate the launch estimate using my own software. The above data are in line with Jonathan McDowell's posting on Facebook yesterday evening. Is this the satellite that is supposed to have an in-orbit manoeuvre capability? I guess it's also on Heavens Above. I download the two-lines each day and use Orbitron on my laptop. 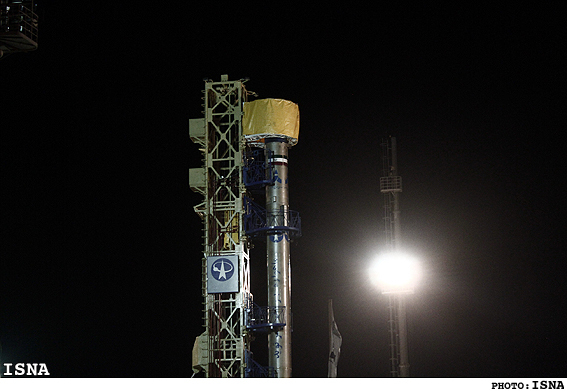 Concerning the reports of an enlarged upper stage: I have compared photographs of the recent launch vehicle, the one which launched Rasad and the earlier one, which was on public display around the time of the Omid launch. Apparently, they have all the same dimensions. A visible difference of the vehicle on display was, that the two protrusions on the upper end of stage 1 are smaller than on the later vehicles. Sadly, Israel hypocritically calls anything launched either by or for an Arab country a "spysat", whether or not it has an imaging system on board. Israel is scared of the Arab countries gaining the technology which it has used for more than 15 years. 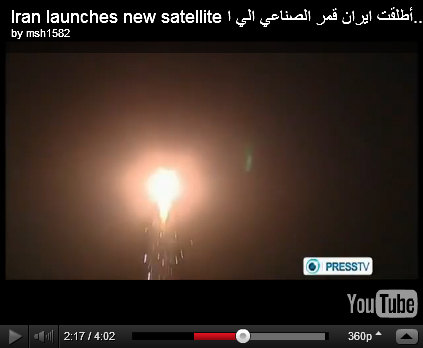 My worry is that Israel might have some form of basic ASAT capability and they might use it against an Arab satellite. Iran is very far from developing a spysat , the Navid is a experimental observation satellite made by Iranian university students. Iran isn't an Arab country , the majority of Iranians are ethnic Persians and Persian is the official language of Iran . Has anyone a good explanation on the nature of these "pieces" dropping off the vehicle? Could it be ice coming off a possible LOX-tank on the lower or upper stage, or is it combustion related? Sorry for showing my ignorance about Iran vs Arab. No offence to anyone intended. These are early days and things may change, but SatEvo, using the available Space Track TLEs, is predicting Navid will reenter in mid-April. The rule of thumb uncertainty is around two weeks at this point, so "sometime in April" is a reasonable paraphrase. How closely related to the original Scud missile is the Safir. I know that it's probably derived from the North Korean Nodong, which itself comes from the old Scuds, but is there still some similarity to the Scud (tank diameter, propellant etc.)? "The dreams ain't broken downhere, they're just walking with a limp"
The head of Iran’s space agency acknowledged Sunday that the cameras aboard Iran’s past and planned satellites are too poor to give useful images, but said the country is now working on a satellite to be completed in four years that will produce useful images. The government has boasted of the images sent to earth by the Rasad (Observer) microsatellite that was orbited June 15. But while the regime has spoken of the pictures, it has not released any of them to the public. On Sunday, Hamid Fazeli did not boast of the photos from outer space. In fact, he said even the Amir Kabir, Navid and Zafar that Iran is planning to orbit in the next few years have cameras that take pictures of very low resolution and limited utility. But he said the space agency is now working on a new satellite called Pars-2 with a camera that will have a resolution of five meters, meaning it can pick out objects that are five meters or 16 feet across. Iran has not described the resolution of the camera on board the Rasad, which is still orbiting the earth. But it has given the resolution of another camera being prepared for orbiting. And that camera will provide photos only 1/800th as good as satellite photos that are available commercially. A few months ago, Hossain Bolandi showed off the Navid satellite he is working on. It weighs 50 kilos, triple the size of the just-launched Rasad. Bolandi said the camera on the Navid would be able to see objects more than 400 meters across or the size of four football fields. But commercial satellites like the GeoEye1 that are currently in service show objects only 50 centimeters (20 inches) across and US spy satellites are understood to discern objects as small as 1 centimeter (a half inch) in size. Fazeli’s statement that the Pars-2 in four years will see objects five meters across will still mean that commercial imagery will be 10 times better than what the Islamic Republic is aiming for. Is Navid's cots camera comparable to that of Unisat-4 ? The UniSat-4 microsatellite hosts two CCD-based programmable cameras. The CCD sensor contains 640 x 480 pixels. The JPEG compression algorithm is used with the compression factor selectable by ground command. The two cameras have different optics and resolution. In this way, UniSat-4 is able to take pictures of the Earth's surface in the northern hemisphere. One camera is provided with optics of 2.5 mm focal length, providing a FOV (Field of View) of 84.6º and a resolution of about 0.8 km/pixel. The second camera is equipped with optics of 6 mm focal length (36.8º FOV) providing a 0.3 km/pixel resolution. The FOVs of the two cameras are overlapping to take imagery of the same target area with different resolutions.